Using RaspiStill to take a picture with JPG encoding I am getting a file that is over two megs. When I reduce the quality down to 50% the file size of the picture taken only drops the file size by about 200K, or less then a ten percent decrease. When I take that original 2 meg+ file and save it through Paint.Net with the quality set at 85 percent it drops the file size down to 300k, or almost a 90% decrease. Am I doing something wrong, or is there something wrong with the encoder in RaspiStill? Out of interest, what size file do you end up with if you use -q 15 with RaspiStill? Does it turn out to be roughly the same as Paint.Net at 85%? GTR2Fan wrote: Out of interest, what size file do you end up with if you use -q 15 with RaspiStill? Does it turn out to be roughly the same as Paint.Net at 85%? As you decrease the quality, the size decrease by about 10% for each 20% of quality decrease. The file size drops to about 50% when you get down to about 5% quality. The image itself is blocky and almost unrecognizable. None of this matches the decreases and quality you get with normal jpeg compression. Oh, and for the record apt-get update and upgrade with no effect on the outcome. The thing is, there is no 'normal' jpeg compression. Most implementations handle 'quality' in a different way , so Q50 on one system in all likelihood won't match Q50 on another system. Just try numbers until you get what you want. Quality factor != percentage. http://photo.net/learn/jpeg/#qual has a reasonable explanation. I do vaguely recall that our default is not the IJG quantisation tables, but i can't remember what is used instead. I would have expected a bigger change than 200kB when dropping to q=50. As Jamesh says, q factor can rarely be compared accurately from one app to another. Find a number that give you the file size and compression ratio that you want in your chosen app. Last edited by mikerr on Thu Mar 27, 2014 1:56 pm, edited 3 times in total. Just done a quick comparison of the official IJG quantisation tables against our default ones. Comparing against mikerr's file sizes (top), you can see there aren't any significant differences vs IJG (bottom). As my camera isn't on a mount, my scene may have changed slightly between shots hence my graph isn't totally smooth, and Mikerr's numbers dropped to 2sig.figs for the top results producing an artificially flat line. Based on that, I see no point in pursuing this further - there is very little difference between the two sets of tables, and users just need to be aware that the quality setting is not a percentage compression ratio. Can you use imagemagick's indentify to get the quality for your different q values? you find the value "Quality: " which should correspond approximately to the quality definition used by gimp and other tools. Would be interesting to plot your q values against this Quality values. It seems that, i.e., -q 20 correspond to Quality=75 in imagemagick. Thanks for the quality values. I have tried to fill some values with my camera. So we can adjust the high quality values very fine. But need to go down to small "-q" values for high compression. That's ok for me. Well, that's more than a little insane. Why make the quality values logarithmic-esk? This would explain how there was no detectable change in value until it seem to drop off a cliff when the quality value got down to 5. That's because it was falling off a cliff. 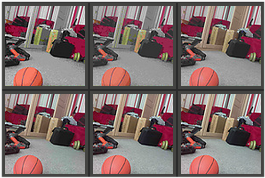 I ran the tests again -- consistent lighting with an uncomplicated picture (camera pointed at window blinds). With a VGA size picture the change from quality 100 to 10 was about 75% drop (from 170k to 41k) with very little change in apparent quality. From there each drop in number was a serious drop in quality with little change in size (from 40k at quality 9 to 31k at quality 1). Even with this knowledge, this still represents poor performance for Jpeg compression. Testing with several other utilities (including on that uses the same C-Library advertised to be used by Raspistill) I consistently saw a drop to under 15K for the same image with very little degrade in quality. While still an irritant, at least now I know how it works. The logarithmic-esk values do not provide for fine-tuning, so I think some post processing will be required as keeping the file size down is vital to this particular project -- a remote weather station connect via a 56kb radio modem. Thanks to ethanol100 for the information. At least I know what I am dealing with now -- the graph was particularly useful. Have you tried to disable the thumbnail image(-th 0:0:0, not sure about that.)? This should be a relative big part of your file size at low resolution and high compression. codingCat wrote: Well, that's more than a little insane. Why make the quality values logarithmic-esk? Insane? The graph matches the standard Independent JPEG Groups quantisation tables, so in that case they must also be insane. As above, turn off thumbnails. I think the quantisation tables can be changed, but the encoder itself in a HW block, so that isn't going to change! codingCat wrote: I ran the tests again -- consistent lighting with an uncomplicated picture (camera pointed at window blinds). With a VGA size picture the change from quality 100 to 10 was about 75% drop (from 170k to 41k) with very little change in apparent quality. From there each drop in number was a serious drop in quality with little change in size (from 40k at quality 9 to 31k at quality 1). No, its not a match. Its not even close. The graph posted by 6by9 above shows a 45degree angle until it gets towards the top of the graph. You could argue that this is the same data spread out over a greater range, but that is actually my point. Compression and Quality loss is insignificant until you are down to quality value of 10. This leaves almost no granularity, no room for adjustment. The original file at quality 100 was 170k. Bringing down to quality 10 dropped the size to 40k. Turning off the thumbnail at quality 10 dropped the size down to 20k... which is what you would expect from a Jpeg with a quality setting of 85. My thanks to mikerr and ethanol100 for the thumb nail suggestion. The raspberrypi cam is more a "digital camera" than a usb webcam. So we need to compare it to i.e. a Canon EOS camera, these will usually have only 2 possible compression levels, i.e. fine and normal, fine will correspont to some value >98. The average user will use high quality jpeg for stills. For video and streaming the more advanced h264 codec gives a better way to specify bitrate. What application do you have in mind? Why do you need these low quality jpegs? I don't need low quality images, I need small ones. I am creating a weather station with temperature, humidity, atmospheric pressure sampled every second, and a picture taken periodically. All of this information has to stream live via a 56kb radio modem. I don't want to interrupt the live data stream for more than 30 seconds at a time, so I need a really small file. A two meg (aprox. what you get from the default camera settings) will take six minutes to transmit under ideal settings (5k per second). With the nature of the radio modems a file that big in a real world environment will take almost half an hour to transmit. With the file squished down to 20k, worst case will only take three minutes to transmit, with very little trade off in quality. Again, the magic of Jpegs. With, i.e., "raspistill -ISO 100 -w 640 -h 480 -th none -x none -q 10 -o test.jpg" test.jpg has only a size of 16k. codingCat wrote: I don't need low quality images, I need small ones. I am creating a weather station with temperature, humidity, atmospheric pressure sampled every second, and a picture taken periodically. All of this information has to stream live via a 56kb radio modem. I don't want to interrupt the live data stream for more than 30 seconds at a time, so I need a really small file. A two meg (aprox. what you get from the default camera settings) will take six minutes to transmit under ideal settings (5k per second). With the nature of the radio modems a file that big in a real world environment will take almost half an hour to transmit. With the file squished down to 20k, worst case will only take three minutes to transmit, with very little trade off in quality. Low size will generally mean low quality -there is most certainly a tradeoff. If we could get high quality and low size, everyone would use it. There are mechanisms to getting better compression and *apparently* the same quality, but there is always a tradeoff. For video (via raspivid) you specify the bitrate desired and the codec should adjust whatever parameters it has to try and achieve the best quality at that bitrate. -b option.